If you could see my sewing room table right now you'd notice two things. 1. It's messy but colourful. 2. 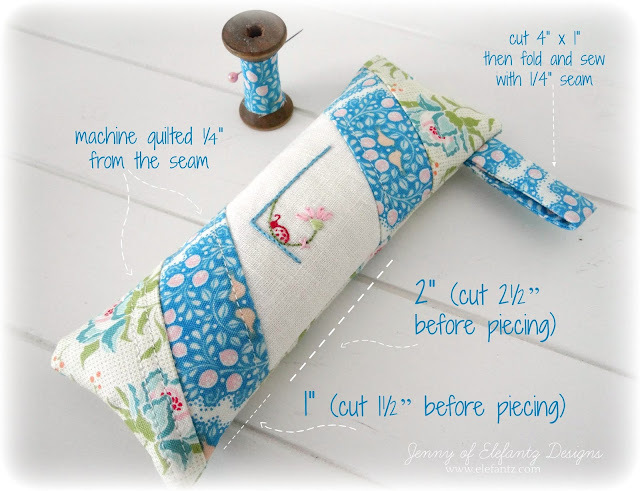 There are many fabrics in piles of two or three prints waiting to become the next pincushion. I'm thoroughly enjoying this process as I'm discovering many fabric combinations I'd not considered before and once they have been placed int their own little pile on my sewing table I'm quite hesitant to remove them because I love them all. This week 'love' is quite appropriately the letter L along with two lovely aqua toned prints which have partnered to give you our newest pincushion idea. Stitched onto a cream cotton/linen blend background I rotary cut the completed block on a 45 degree angle before sewing a 1½” wide piece of aqua floral (from Tilda's Lemon Tree range) top and bottom. 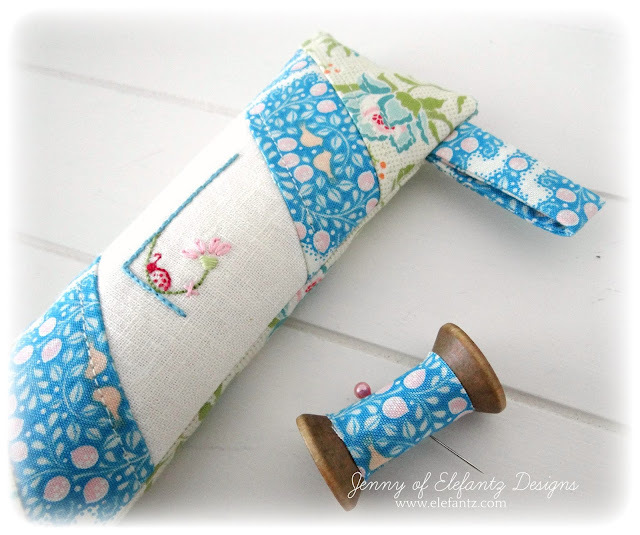 Then I added a 3" wide piece of aqua/green floral (from Tilda's Circus range) top and bottom again before cutting the top and bottom straight to give the front of the pincushion an angled appearance. Because that Lemon Tree print really has impact with it's beautifully deep aqua background I decided to add a little loop to the side. Now, the L must be for Ladybug, right? 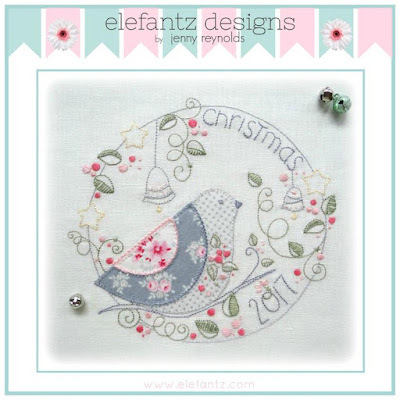 Embroidered with a mix of chain stitch, backstitch, satin stitch, lazy daisy and french knots (plus a wee pink cross stitch) this tiny L shows you can add a lot of variety within a very small design. This pattern is free until December 6th, along with the J and K patterns. 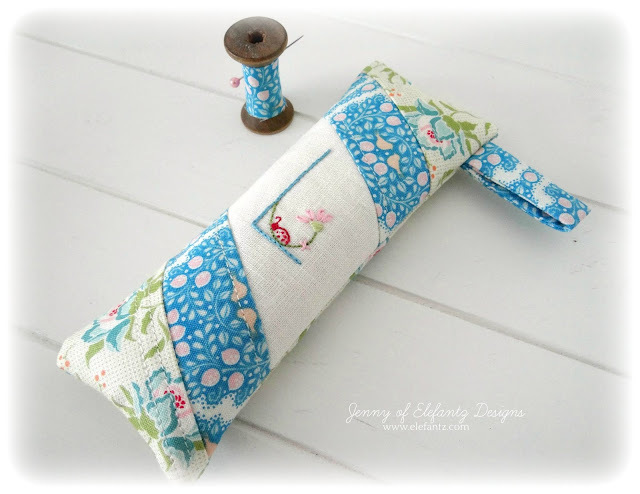 Scroll my blog for those links if you missed the last two pincushions. The patterns for A-E and F-I are available to purchase here in my shop for $2 a set. There's a countdown to Christmas happening and when I was at sewing group this week I saw some beautiful handmade decorations. This reminded me I've not made a decoration for this year so had best get to it very soon. I hope your weekend is lovely, filled with all good things, people who care about you, something to sew and delicious comfort food that quite simply makes your heart smile. Follow my blog and never miss a post here at Bloglovin! Gorgeous Jenny. Love the Christmas decorations. 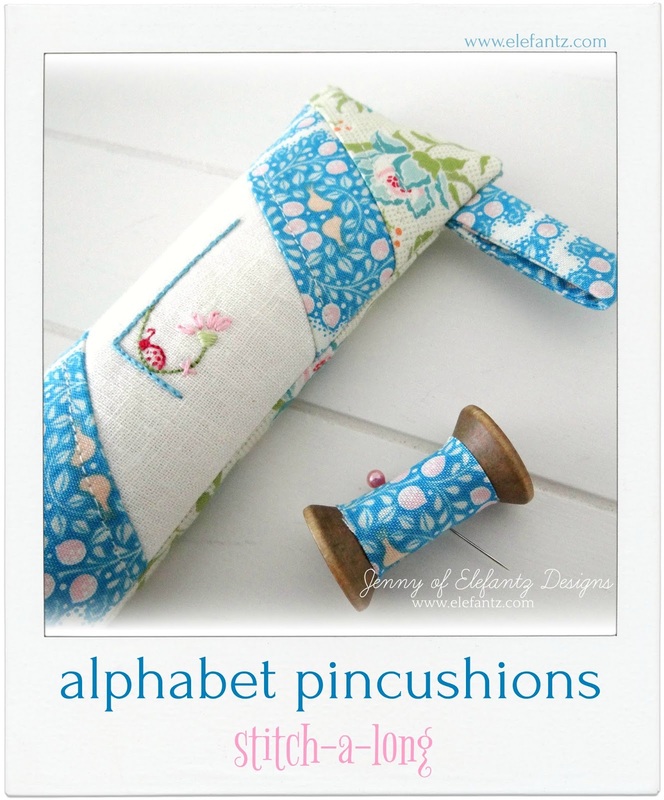 Thank you so much for the pincushion patterns. I have enjoyed working on the embroidery and have three ready to complete into pincushions. I will have make more than one L as I have a couple of friends that should have one of these. I love the angles you used in finishing this one. I’m avidly following both your alphabet and sweet BOMs. Thank you! And the ornaments are so beautiful...I’d love to try my hand on one of those. Truly I keep telling myself that I WILL start embroidering, again, soon! Life. Is. So. BUSY! However, when I click on the link for the ornament patterns, I keep coming up empty handed...could you perhaps assist me a little in finding them? I’m hoarding up all these patterns for the day I hit the ground running with my embroidery. Any day, er, month? Year, now...honest, I keep telling myself. The links open at dropbox or google docs...one of them should work for you as there hasn't been any other problems. I’m afraid the links to the ornaments take me to your shop, and I can’t find the ornaments in there. Oh, well, it must just be me and/or my iPad. I do rather like those colours you have chosen and the angled patchwork design really adds something special. Another brilliant idea. Thankyou so much for sharing . I still like the Christmas designs. What a lovely pincushion. I like the fact that it's tall, just like the letter L, and that you added the adorable ladybug! I hope your weekend is filled with all the best things you like. 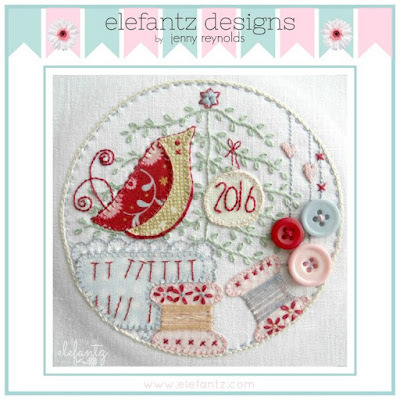 I love the idea of making a a Christmas decoration each year. The kids often do, But I do not. But I think I shall start!